The book includes more than 350 explanatory, close-up photos and illustrations. One of the oldest forms of welding, arc or "stick" welding offers versatility, strength and the ability to handle big projects and thick materials. Also, introductory equipment can be purchased inexpensively. There are some rather expensive arc-welding machines, bu the most common AC-current machines will do fine fort he home/shop user doing standard projects and repairs. If you have thoroughly read Chapter 2, you should have a good understanding of the various kinds of welding equipment and what each type is capable of. If you think the arc welder serves your needs, then this chapter will give you a basic introduction to the equipment and procedures involved. When shopping for a machine, you may see them referred to as SMAW welders, which is the technical description of the process for Shielded Metal Arc Welding. Basic-yet-rugged arc machines are available today in welding equipment stores, major nationwide stores such as Sears and Montgomery Ward (and their mail-order catalogs) and can sometimes be found at a good savings in large lumber/home supply centers that carry a lot of power tools. Most starter units are sold with a complete setup, including welding gloves, helmet, chipping hammer, sample electrodes, and a basic instruction book. Other than the consumable welding rods, there will be little else you will ever have to buy to continue arc welding. All electrical-welding processes use the flow of electricity to create heat. The power flows from the torch or electrode to the work, which is grounded to the source at the machine. In arc welding, the consumable electrode or rod makes the connection that creates the arc to the piece being welded. The welding rod is a metal rod coated with a hard flux material. As the arc is created when the tip of the metal comes to the workpiece, the heat generated at the bead is 6000anddeg; F or more, which melts both the parent metal and the filler rod, while simultaneously vaporizing the flux coating to create a gas shield around the bead, protecting the solidifying weld from contamination by gasses in the air (see illustrations). The flux actually re-solidifies on top of the bead as a hard coating and slag, and when you look at a completed bead, you'll see a dome of ceramic-like material over the weld. At this point, the weld doesn't look very impressive, but when you remove the slag with a chipping hammer, a beautiful, clean bead is revealed (see illustrations). The array of available MIG machines aimed at the consumer and small shop market has greatly increased in the past decade. Many automotive body workers and fabricators in small shops used to dream of having a MIG welder to round out their capabilities, but the machines available at that time were either very expensive self-contained MIG machines or wire-feeding attachments for already-expensive, large-size arc/TIG power supplies found only in welding shops. The hobbyist, auto body man or muffler shop couldn't justify the expense. That changed when imported MIG machines started making their appearance in the US, aimed at the hobbyist market specifically. There are two basic types of smaller MIG machines you'll be looking at, the gas-shielded type that uses bare electrode wire and a bottle of compressed gas, and the flux core type that uses no shielding-gas bottle but has a special wire with a fluxed core inside that produces the shielding gasses as you weld, much like the vaporizing coating on arc-welding rods. There are advantages and disadvantages to each type, and your choice depends on the kind of work you will be doing. Most of the machines on the market are for use with bottled shielding-gas, and there are some units that can be equipped for either type of wire, in case you have need for both. These machines cost a little more than single-use MIG machines because they have a switching device inside to change from reverse polarity (with the torch being positive and the work negative) which is required for the solid wire, and straight polarity (with the torch negative) for the flux-cored wires. Input current is the next consideration in shopping for a MIG machine. There's a number of home-type machines that can be operated on standard household 110V current, which negates the need for any rewiring of your shop area, and also makes them more portable in the sense that you can use one anywhere there is a source of standard power. When those who are interested in welding talk about fusion techniques, the subject of TIG welding is held in a certain reverence. Its reputation in this regard partly stems from its place in history as the method used for construction of a great many famous aircraft. Although developed initially in the 1920s, TIG (Tungsten Inert Gas welding) wasn't used much because the helium shielding gas was too expensive. The intensified research atmosphere of WWII spurred further development as aircraft were being made lighter and lighter and TIG became the preeminent method of joining such non-ferrous materials as aluminum and magnesium. The Linde Corporation (now L-TEC) was the first company to capitalize on the technique, and after the war their trademark name "Heli-Arc" became the defacto generic name for TIG welding. Many welders today still use the term heli-arc more often than TIG as a description of this type of welding, even though a number of other companies have been making TIG equipment for many years. Besides the romantic beginnings, the TIG process has been considered quite special for other reasons. It does take considerable practice to be good at it, and, because the equipment has always been rather expensive, a welder who had one and was good with it, developed a reputation, particularly in the field of esoteric materials and exotic construction in aircraft and race cars. Haynes repair manuals can save you money on maintenance and repair bills. Step-by-step procedures and illustrations guide you through every job. External Links: Welding from Wikipedia. 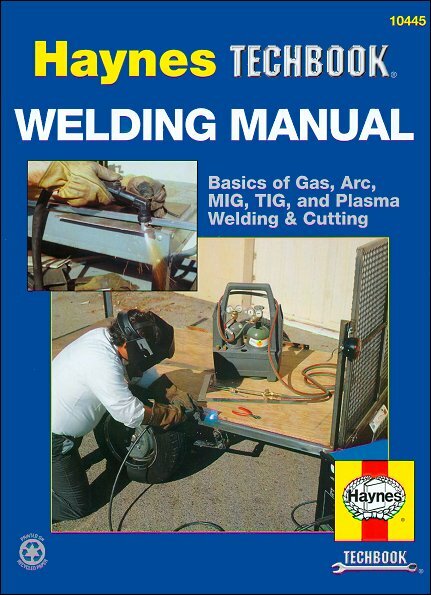 Ask a question about The Haynes Welding Manual.